Poppyprint: Level Two Tote - A Pattern Release! Level Two Tote - A Pattern Release! Hi all! Exciting news today. I've finished up an new pattern and it is now live in my Craftsy shop right here. 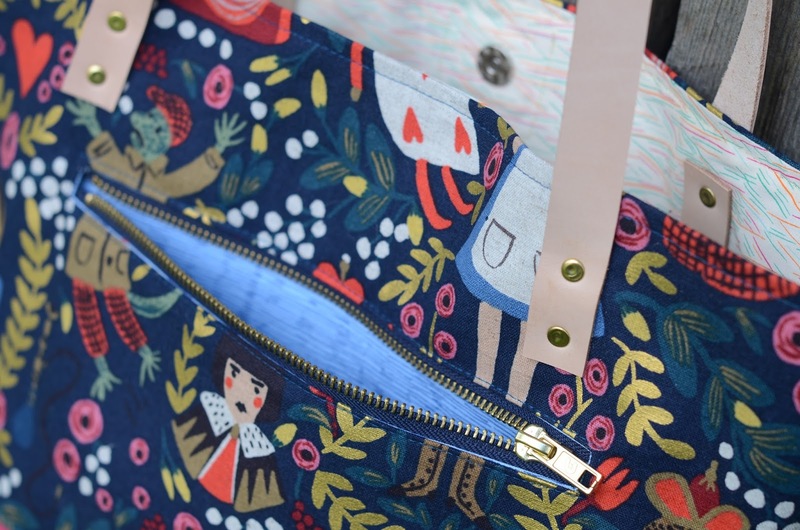 I've always been a bag lady and have made umpteen bags from many fabulous patterns available out there, but I put my favourite simple requirements together and came up with my own design. You've seen a few of these totes I've made over the last 18 months. 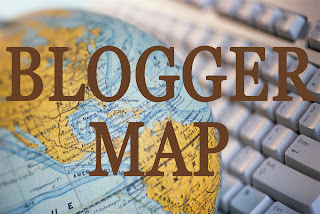 Initially, I designed one for myself as a simple last-minute bag to take with me on a trip. Since then, I've made a few others as gifts for friends, each time refining the design. Finally, an Instagram follower commented "Please tell me you are making a pattern for this! I want to make one!" Well, my friends. Ask and you shall receive. That IG follower even offered to pattern test for me and she made a beautiful tote! Here's my latest version that appears on the pattern cover. 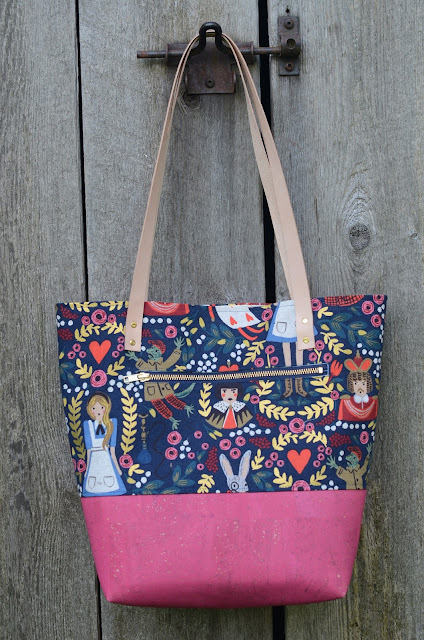 I made it with the gorgeous Rifle Paper for Cotton and Steel Alice in Wonderland linen blend and the most perfect shade of fuschia cork fabric that I was able to purchase at my LQS. 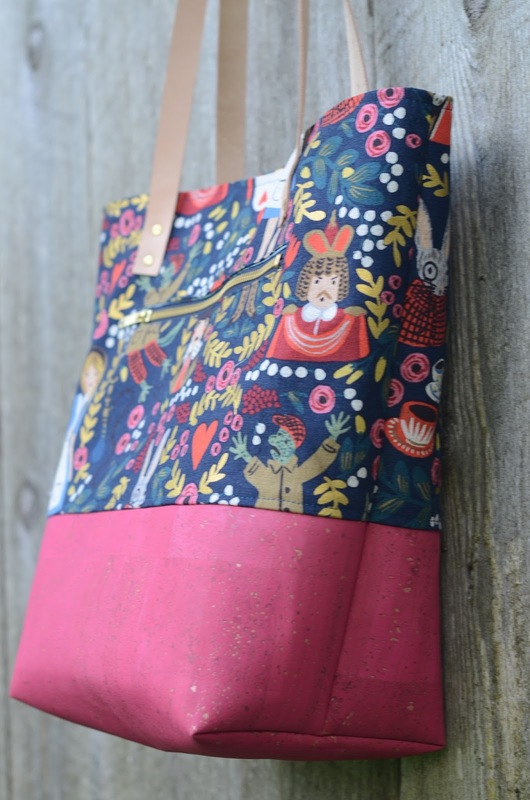 In the pattern, I list various sources for materials you'll need to make this tote. There are fully illustrated and thoughtfully explained instructions for creating a zipper window like you see here. You'll also learn how to install a magnetic snap if you haven't tried that yet! This LEVEL TWO TOTE is so named because there are a few potentially new skills to learn, but also for that bottom level fabric that is chosen for durability and wash-ability. I've suggested waxed canvas, cork, vinyl or lightweight hide. My next one will be made with leather! I've been using my original tote as my everyday purse and it is perfect for me. I wanted an uncomplicated bag that didn't have too much structure or fancy hardware detailing. This tote has plenty of room to accommodate a few extra things picked up during the day (like, for instance a yard of fabric, 5 FQ's or a couple of skeins of yarn.....ahem). There is no central bottom seam and the leather handles are securely riveted on; both details that really increase the strength and durability of this bag. I regularly carry a full water bottle, heavy wallet, sunglasses, chequebook, iphone, car keys and a few pens around in mine. There's an internal slip pocket with two pen slots and the external zip pocket is large enough for your cell phone. I hope you'll try one for yourself (and then make lots more as gifts!). 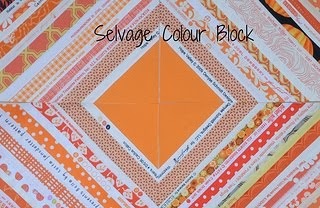 It's an afternoon or evening project that only requires 6 rectangles of fabric! For real! Special thanks to Jackie and Eileen for testing this pattern so thoroughly for me! I may have to make a couple of these at a coming retreat. ;0) They will make lovely gifts! Lovely! I like it alot! I see a few of these bags in my future. Especially want to learn putting on the leather handles. 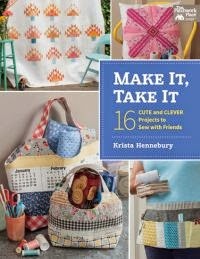 Happy for you and another pattern release! I absolutely love this bag!!! Congratulations on the pattern release! I'm looking forward to making at least one! 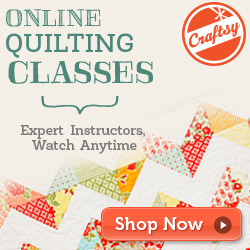 Hi Trish There are a couple of live links in my post that will take you directly to the Craftsy listing to buy a .pdf download of the pattern or you can click on the image of my Round Peg quilt on the upper right sidebar that will also take you to my pattern shop!